KoopaTV: George Zimmerman's Civil Rights Charge Is Off... So Enjoy Smash 4! George Zimmerman's Civil Rights Charge Is Off... So Enjoy Smash 4! By LUDWIG VON KOOPA - This article is a direct result of what happens when KoopaTV adheres to its "one article per day" mantra. Fantastic news and day all around. As you all very well know, Super Smash Bros. For 3DS comes out today. I don't really need to tell you that though. After all, almost a half of KoopaTV's articles up to this point have been about Smash 4 or related to it. This is it. This is what we've been hyping up for over a year now! IT'S HERE. ...Well, technically we've been hyping up the Wii U version, but, you know. But this is also a special time for another reason! Attorney General Eric Holder is leaving the government payroll and resigning. But we knew that last week. But what we just found out? The Justice Department is calling off its civil rights case against George Zimmerman! Or, uh, it's going to be called off. It's not officially confirmed yet. That civil rights investigation is George Zimmerman's biggest fear right now, according to an article from GQ Magazine. By the way, read that article. It's hilarious. Better than this article will be. Hopefully Mr. Zimmerman can relax now. It's in KoopaTV's best interest for the guy to finally catch a break. And now... he can play Super Smash Bros. 4! However... every time he'll play it... he'll have to be reminded about how close he was to getting into the final roster. He was JUST barely cut. George Zimmerman is grinning at the Super Smash Bros. 3DS XL! Get yours! Without that rabid liberal ideologue Eric Holder trying to twist the definition of justice (we've been against the Justice Department doing that for a while), George Zimmerman can take well-deserved time to himself with features like online play (because he can't be near other people) and Smash Run! He can grind custom moves and equipment to have variety in his character choice! Especially with the Mii, where there are many hats he can collect. And you can too! The game is out NOW. You can purchase it from the Nintendo eShop for $40, or from a brick-and-mortar store. ...I'm doing the latter, because, as you recall, I pre-ordered the game at Best Buy. Why? To get the gold coin. 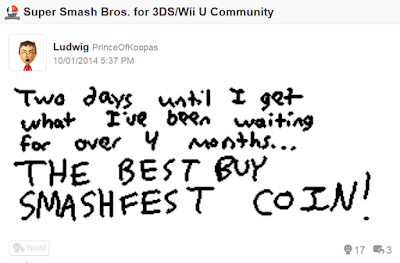 If you would like to challenge Ludwig in Super Smash Bros. 3DS, post your friend code in the comments below! Ludwig's is 3351-5164-3598! 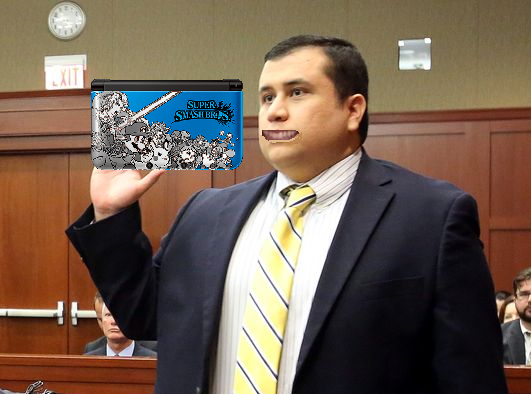 We also recommend that George Zimmerman finally play the Ace Attorney series. See our review of Phoenix Wright: Ace Attorney - Dual Destinies here! Ludwig puts the coin on video here! This is what we did for the Wii U version. The federal civil rights lawsuit has finally and officially been removed.